The ACCESS or "AXS" boot brings a refreshing simplicity and efficiency to the surf boot. By keeping seams minimal and having a low-profile design, we were able to improve durability and keep costs down. Those key benefits are passed on to you while still being an excellent cold water boot. If you want maximum functionality, comfort and flex, the AXS boot simply does it all without breaking the bank. BionicFoam an extremely durable and wear-resistant 4-way stretch neoprene that is virtually bomb-proof and that will stand the test of time. 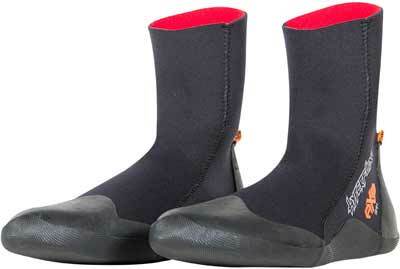 ExoShell Membrane a vulcanized heel lock/ arch membrane that improves support, comfort and fit. Unmatched Price Point your wallet will thank you and you will be warm, comfortable and happy. A superior value among all other options.